Sign Up for free to save time shopping Dr. 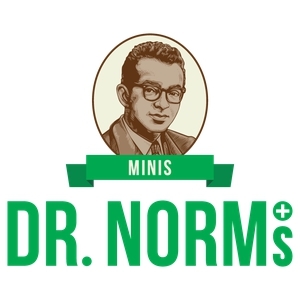 Norm's's wholesale products on LeafLink. "Family Owned • Amazing Taste • Precisely Dosed"
Delectable Cannabis & Pure CBD Cookies! Premium distilled cannabis oil is what makes our cookies taste better than all the rest! We use only the finest ingredients in all of our delicious products - and they have NO WEEDY TASTE! We like to say.. TASTE THE COOKIE NOT THE CANNABIS! • Dr. Norm's was founded by the brother & sister team of Jeff Koz and Roberta Koz Wilson. • They started the company in honor or their dad, the REAL Dr. Norm Koz. • Dr. Norm's also honors their mom Audrey - a pharmacist by profession, but an amazing baker by passion. She believed the best prescription for any ailment was one of her incredible home-made cookies. • Dr. Norm's cookies are based on her "secret" recipes. • We honor their healing, compassionate and humorous ways in all that we do. Ten of our 10mg THC Regular-Strength Cookies, for those with a slightly higher tolerance. 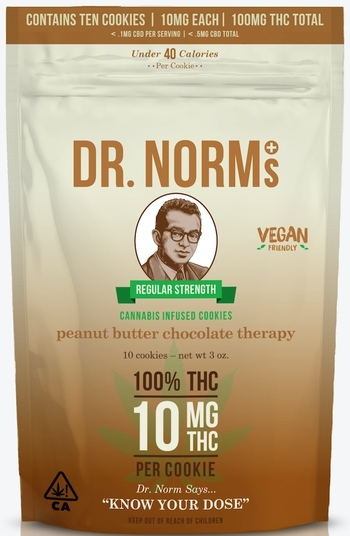 Try our new Vegan Peanut Butter Chocolate Therapy, precisely dosed with 10mg THC. Premium distilled cannabis oil is what makes our cookies taste better than all the rest! 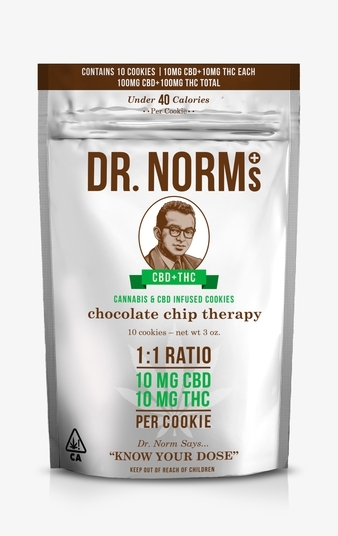 1:1 CBD+THC - Chocolate Chip Therapy Cookies NEW! 10 of our original Chocolate Chip Therapy Cookies, each infused with 10mg of THC and 10mg of pure CBD. Perfect for patients looking for a smoother, more focused experience, with the THC and CBD combination providing more potent healing properties to assist with numerous physical and emotional ailments. 1:1 CBD+THC - Vegan Peanut Butter Choc Therapy Cookies NEW! NEW! 10 of our Vegan Peanut Butter Chocolate Chip cookies, each infused with 10mg of THC and 10mg of pure CBD. Perfect for patients looking for a smoother, more focused experience, with the THC and CBD combination providing more potent healing properties to assist with numerous physical and emotional ailments. Dr. 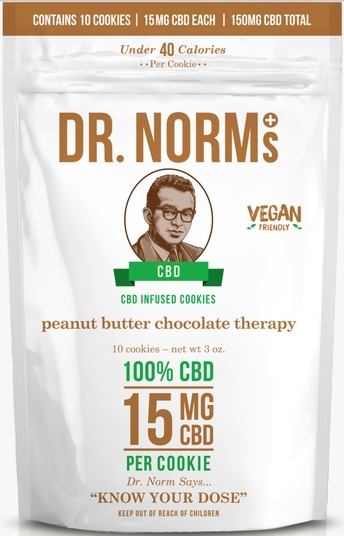 Norm's Vegan Pure CBD Peanut Butter Chocolate Therapy. Each delectable cookie is infused with 15mg of 100% Cannabis derived CBD. 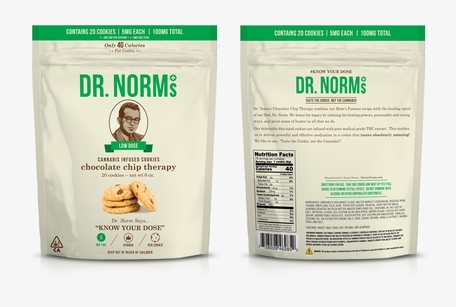 The bag contains 10 cookies for a total of 150mg CBD. Made with all natural and organic ingredients and 100% Vegan. 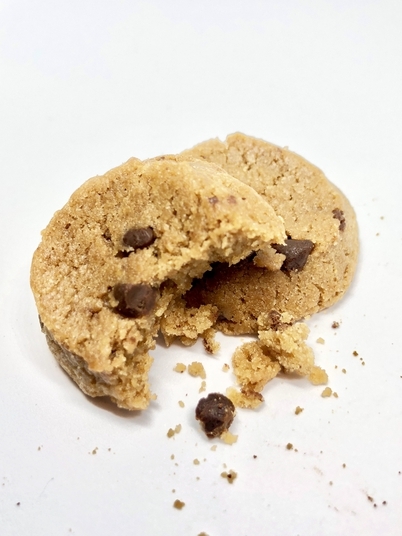 This cookie satisfies the need for a substantial dose of CBD - in a delicious bite sized VEGAN morsel! Two Dr. 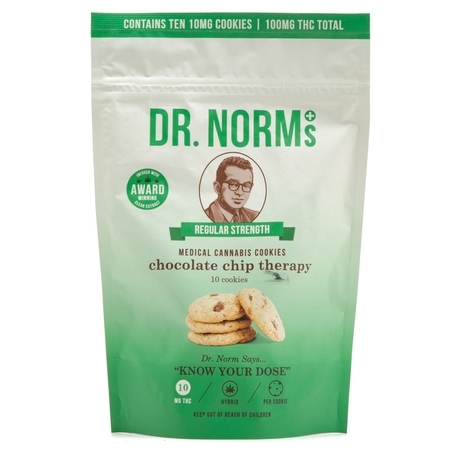 Norm's Vegan Pure CBD Peanut Butter Choc Chip cookies. Each bite-sized cookie is infused with 15mg of 100% Cannabis derived CBD. Made with all natural and organic ingredients and 100% Vegan. This cookie satisfies the need for a substantial dose of CBD at a lower price point. A great grab and go! 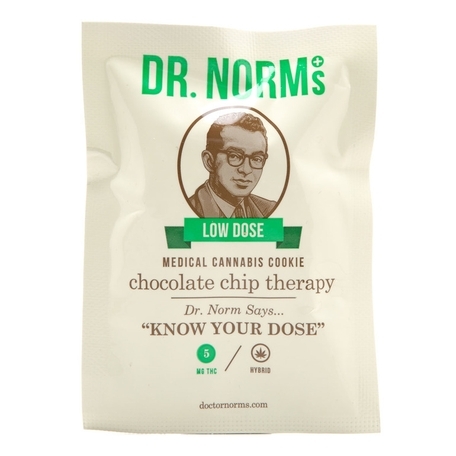 Our original LOW DOSE cookie, IDEAL for Micro-Dosing! It’s the one we started our company with using our mom’s 'famous' recipe! These cookies are crunchy on the outside but soft and chewy on the inside. They are generously filled with chocolate chips and finely chopped pecans and have a surprise crunch from Heath Bar toffee bits. 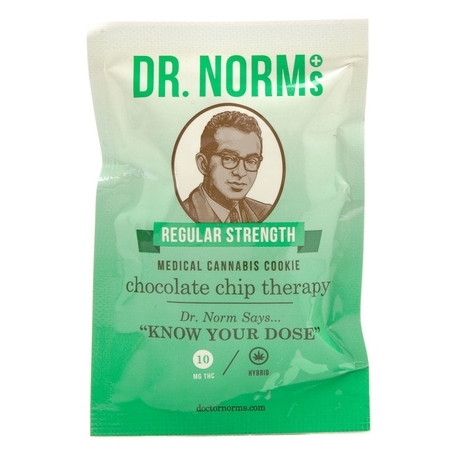 A great way to introduce your patients to our cookies...try them as a grab and go!